The α-ketoglutarate/iron-dependent dioxygenases and halogenases are typically recruited to run a wide range of enzymatic reactions ranging from hydroxylation to halogenation. Despite this useful palette of reactions, no C-N coupling by this class of enzymes has previously been reported. Bollinger et al. discovered that an αKG/Fe-dependent halogenase, SyrB2, can catalyze aliphatic nitration and azidation reactions. 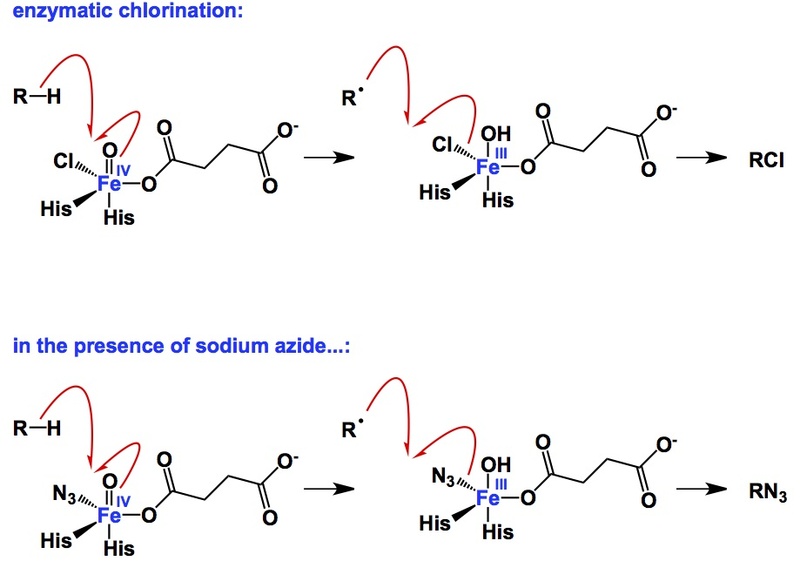 I am showing the azidation process above, which takes place when excess sodium azide is fed to the enzyme (thus, azide anions outcompete chloride anions). Despite the fact that chemical yields in the present version of the process are still very low, this study opens up new possibilities for nitrogen transfer by selective enzymatic C-H activation. It is conceivable that engineering of substrate specificity through directed evolution might be achieved in the future iterations of this system.